How was today’s race for you? Today’s race was quite important for us because we had to meet the qualifying time to participate in the IAAF World Championship due in Qatar. TMM was the last race in India to attempt that qualification; true, there is still the Delhi marathon remaining but this was the main race. I am happy with today’s race because I managed to meet the qualifying time for the world championship and I also sense my old form returning. I think this is a turning point. After 2018 TMM I went back to Ranikhet. I wanted to take a break. I wanted to spend some time with my family. As you know, Ranikhet which is our regimental training center is the town closest to my home. There was also the onus of training junior athletes and building up my own fitness. 2018 went by in this manner. Are you back in the national camp? No. Around November I shifted to Bengaluru to be with my coach, Surinder Singh Bhandari. I have taken a room on rent. There are fellow athletes for company. We cook food, do everything ourselves. The decision of including me in the national camp or not is for the concerned technical committee of the AFI to take. I cannot say anything on that matter. Running – which is my responsibility, I have executed that part. The rest is up to them. Would you say the same about selection for the IAAF World Championship? You may have met the qualifying time but the actual selection is up to the concerned technical committee? Yes; because there could be other Indian athletes who produce better timing and if there is a quota for the championship only that many may go. But I feel TMM was about the last opportunity you had within the country to achieve good timing. Going ahead, the weather in India will only get warmer. In April I will participate in the 2019 London Marathon. The first goal will be to get a timing of between 2:12 and 2:13 there. And if you go below 2:12 we are in new territory as regards the longstanding national record in the marathon. So London is the main target. I haven’t yet thought of anything beyond that. You have returned to form with today’s 2019 TMM. You completed the full marathon in 2:15:52. How much work is required to get from that timing to 2:12 or 2:13? Two minutes is significant time to shave off in the marathon. For example, if I had been faster by four seconds or so today, I would have accomplished a new course record. That tells you how hard earned seconds are. In sprint events, the challenge is to earn micro-seconds. Then, there is the diet and overall race plan including aspects like physiotherapy. A lot of it will require changing. My dietician has already informed me that I will need to tweak my diet for London. So, there is quite a bit of hard work needed; quite a bit. Participating in 2019 TMM was a decision taken rather late in the day. I decided to run in Mumbai only a month and a half before the event. My eyes were set on the Delhi marathon but then this entry for London came along. If you are running in London and wish to do well there, then Delhi’s dates would seem too close for comfort. That’s when I decided to come to Mumbai. Like I said, I reached here with limited time to prepare – it was all done in a month and a half. But the preparation was nevertheless good. In fact on race day, we covered the first half of the course in Mumbai quite fast. That encourages me as regards the timing hoped for in London. Besides there will be the inspiration you draw from fellow athletes. I think if I stick with the second or third batch of runners in London, I should be able to progress towards the timing I am aiming for. How did you find the weather today in Mumbai? It was warm. Perhaps it wasn’t pronounced enough to call it so but it was hot weather. Those who ran would have realized that it was hot and you were getting dehydrated from within. Do you think better weather may have helped you improve the timing further? Now from Mumbai, you return to Bengaluru…. I have to go to Delhi to get my papers ready for London. To train, I will go back to Bengaluru. Since 2012, my coach is Bhandari sir. Whatever I have achieved so far is thanks to him. He believed in me; constantly motivated me. There have seen a lot of ups and downs in my career. 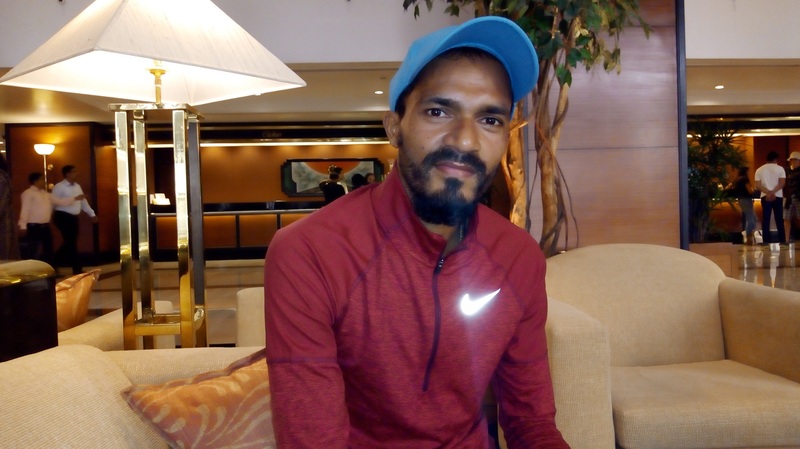 I have been India’s top marathoner, then slid to zero due to injury and spent time recovering. Through all that, if Surinder sir was not there….I am a very emotional athlete. Mental, physical, emotional – I work with all three. I break down so much that recovery can be very difficult. When negative thoughts enter my head I get swept off, I fall deep into it. I need somebody to manage me during such times. I don’t think anybody in India can be that pillar of support for me, as Surinder sir can. I have stuck with him since 2012. As long as I am in sports, I will be with him. You described yourself as someone who has had ups and downs in his career. Have you accepted that pattern as your true nature? I never give up. Nitendra never gives up – that is my strong point. Yes I may go down, but I never give up. When I restart, I try to give it 110 per cent. But I also wonder how things may have been had I managed to stay steady. In 2013, I was a top athlete in 5000 meters when my fortunes plummeted. I had knee surgery. I was back at the top from 2015 to 2016. Then suddenly everything fell apart because I developed a hamstring problem. I recovered from that and set a national record in the half marathon. Then it was back down again; I developed pain in the stomach. So it’s been up and down. I do wonder how things would have been had I got two to three years of steady sailing. Is there any international athlete you look to for inspiration or identify with? For me, it’s Paula Radcliffe. She saw a lot of ups and downs in her life in sports; she had her share of injuries. My first target was to break Paula’s world record. Many people asked – why Paula’s record? For me it was simple – her world record is 2:15:25. I had run at 2:15:48. So that became the first mark to get past.